This guide reviews the research literature on college access and makes five recommendations for how high schools and school districts, starting as early as 9th grade, can help students navigate their way to college. The first two recommendations focus on preparing students academically for college by offering a college preparatory curriculum and assessing whether students are building the knowledge and skills needed for college. These two recommendations reflect the belief that students are best served when schools develop a culture of achievement and a culture of evidence. The next recommendation describes how high schools can build and sustain college aspirations by surrounding students with adults and peers who support these aspirations. Recommendations 4 and 5 explain how high schools can assist students in completing the critical steps to college entry, including college entrance exams and college and financial aid applications. WestEd’s Neal Finkelstein served on the expert panel for this practice guide. What are schools and colleges doing to bridge the gap between secondary and postsecondary school? In this volume, Andrea Venezia, Senior Research Associate at WestEd, and others examine the goals, practices, policies, and outcomes of programs that enroll high school students in college courses for college credit. How can we close the achievement gap for English learners? 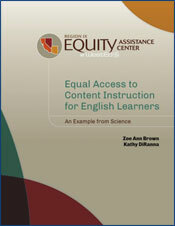 Access to science instruction may be the missing key.